The muscles in the lower extremities, among the longest and strongest muscles in the body, are specialized for locomotion and balance. They include the muscles that move the thigh and leg and those that control movement of the foot. The gluteus maximus, which forms much of the fleshy part of the buttock, is relatively large in humans because of its support function when a person is standing in the erect position (Fig. 4-10). This muscle extends the thigh and is important in walking and running. The gluteus medius, which is partially covered by the gluteus maximus, abducts the thigh. It is one of the sites used for intramuscular injections. The iliopsoas arises from the ilium and the bodies of the lumbar vertebrae; it crosses the anterior of the hip joint to insert on the femur (Fig. 4-16 A). It is a powerful flexor of the thigh and helps keep the trunk from falling backward when one is standing erect. The adductor muscles are located on the medial part of the thigh. They arise from the pubis and ischium and insert on the femur. These strong muscles press the thighs together, as in grasping a saddle between the knees when riding a horse. 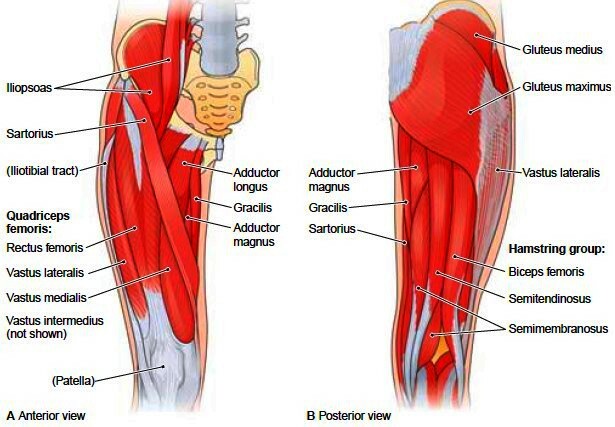 They include the adductor longus and adductor magnus. The sartorius is a long, narrow muscle that begins at the iliac spine, winds downward and inward across the entire thigh, and ends on the upper medial surface of the tibia. It is called the tailor’s muscle because it is used in crossing the legs in the manner of tailors, who in days gone by sat crosslegged on the floor. The gracilis extends from the pubic bone to the medial surface of the tibia. It adducts the thigh at the hip and flexes the leg at the knee. The anterior and lateral femur are covered by the quadriceps femoris, a large muscle that has four heads of origin. The individual parts are as follows: in the center, covering the anterior thigh, the rectus femoris; on either side, the vastus medialis and vastus lateralis; deeper in the center, the vastus intermedius. One of these muscles (rectus femoris) originates from the ilium, and the other three are from the femur, but all four have a common tendon of insertion on the tibia. You may remember that this is the tendon that encloses the knee cap, or patella. Figure 4-10 Superficial muscles, posterior view. Associated structures are labeled in parentheses. Figure 4-16 Muscles of the thigh. Associated structures are labeled in parentheses. This muscle extends the leg, as in kicking a ball. The vastus lateralis is also a site for intramuscular injections. 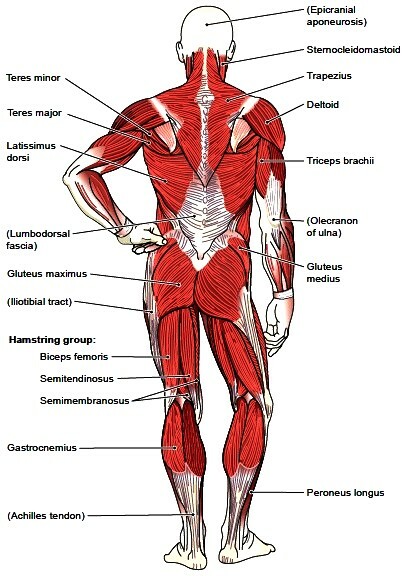 The hamstring muscles are located in the posterior part of the thigh (see Fig. 4-16 B). Their tendons can be felt behind the knee as they descend to insert on the tibia and fibula. The hamstrings flex the leg on the thigh, as in kneeling. Individually, moving from lateral to medial position, they are the biceps femoris, the semimembranosus, and the semitendinosus. The name of this muscle group refers to the tendons at the back of the knee by which these muscles insert on the leg. The gastrocnemius is the chief muscle of the calf of the leg (its name means “belly of the leg”) (Fig. 4-17). It has been called the toe dancer’s muscle because it is used in standing on tiptoe. It ends near the heel in a prominent cord called the Achilles tendon (see Fig. 4-17 B), which attaches to the calcaneus (heel bone). The Achilles tendon is the largest tendon in the body. According to Greek mythology, the region above the heel was the only place that Achilles was vulnerable, and if the Achilles tendon is cut, it is impossible to walk. The soleus is a flat muscle deep to the gastrocnemius. It also inserts by means of the Achilles tendon and, like the gastrocnemius, flexes the foot at the ankle. 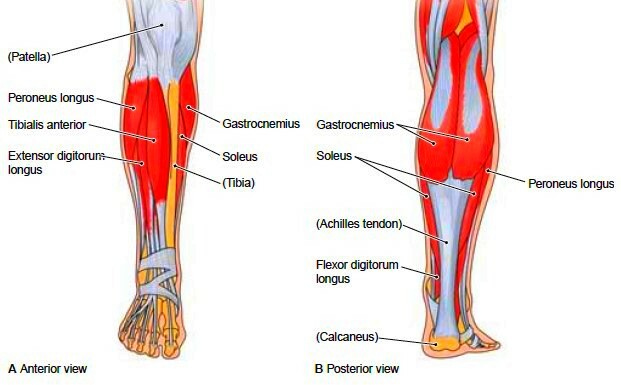 Another leg muscle that acts on the foot is the tibialis anterior, located on the anterior region of the leg (see Fig. 4-17 A). This muscle performs the opposite function of the gastrocnemius. Walking on the heels uses the tibialis anterior to raise the rest of the foot off the ground (dorsiflexion). This muscle is also responsible for inversion of the foot. The muscle for eversion of the foot is the peroneus longus, located on the lateral part of the leg. The long tendon of this muscle crosses under the foot, forming a sling that supports the transverse (metatarsal) arch. Figure 4-17 Muscles that move the foot. Associated structures are labeled in parentheses. The toes, like the fingers, are provided with flexor and extensor muscles. The tendons of the extensor muscles are located in superior part of the foot and insert on the superior surface of the phalanges (toe bones). The flexor digitorum tendons cross the sole of the foot and insert on the undersurface of the phalanges.